It was from time to time that Auspicium felt as if he was living in dullsville. He didn't necessarily feel bad for it, he knew it would be physically impossible for him to be excited about training, patrolling, hunting, and watching over Bel's Furnace every single day of his existence. While he felt immensely proud of the progress being made by the other Initiates and him, as well as the hard work of the Proven training them and spreading what The Order stood for, he just needed a slight change of routine. The wolf, after getting done with his training, decided to go out for a walk to explore the land before his shift taking care of Bel's furnace, he calculated he had enough time for a jog around the forests of the Moonstone Lakes. Not a patrol, but to take some time to stick his nose to the ground and find something interesting to trade, or to keep. He was determined to avoid any canines he detected, as this was time for himself, not for Order work. It was only a matter of time until he found something... interesting he had, at the time, always walked past. The voice of her mother rang in his ears. A flash of sadness and remorse went through the wolf's body. But that was besides the point. Of course when his mother had told him about the "metal skulls" he never really believed her. If they were skulls, how come they could still bite? If they were skulls, why were they made of metal and not regular bone? Now that they were in front of him, covered in all sorts of nature's creations, he had the chance to find out what they really were. All he had to do was get closer. Template by Kitty, image by Wonderlane. Theodora was thinking of a myth. It was one her mother had told her a long time ago, and even she hadn’t spent much time on it—strange of a woman who believed in such fanciful things to doubt any story if you ask Theodora—but nevertheless, it was one that stuck in her memory. It had entailed a magical spring, granting everlasting life and youth to those who drank from it; beauty to those who swam in its emerald depths. Theodora had often daydreamed of leading her siblings and father to it, and living happily ever after. Of course, even back then she doubted the veracity of the claims, but when thinking about it, she thought she could understand at least the message beneath. Where there is water, there are plants. Where there are plants, there are creatures. And creatures mean food. Wellspring of life, indeed, thought the she-wolf, her snout pressing downwards as she followed the scent of a hare. She was feeling improved (and perhaps had Calrian to thank for that), and the wound on her flank was slowly but surely stitching itself back together. The hound considered, optimistically, that she may be able to hunt again. Theodora figured she may as well give it a try. Thus she found herself tracking around the Moonstone Lakes, doing her best impression of a huntsman, only slightly limping on that back leg. To and fro she followed the rabbit’s furtive movements, knowing it was nearby. Then, she found an even more pressing scent. A wolf. It was different than the two wolves she had met on this territory before (one aggressive and wild, the other helpful) and with 50/50 odds at this point Theodora considered simply turning around and leaving the area. She even angled her upper body to go right back the way she had come, but something stilled her movements, strengthening what little bravado she had. 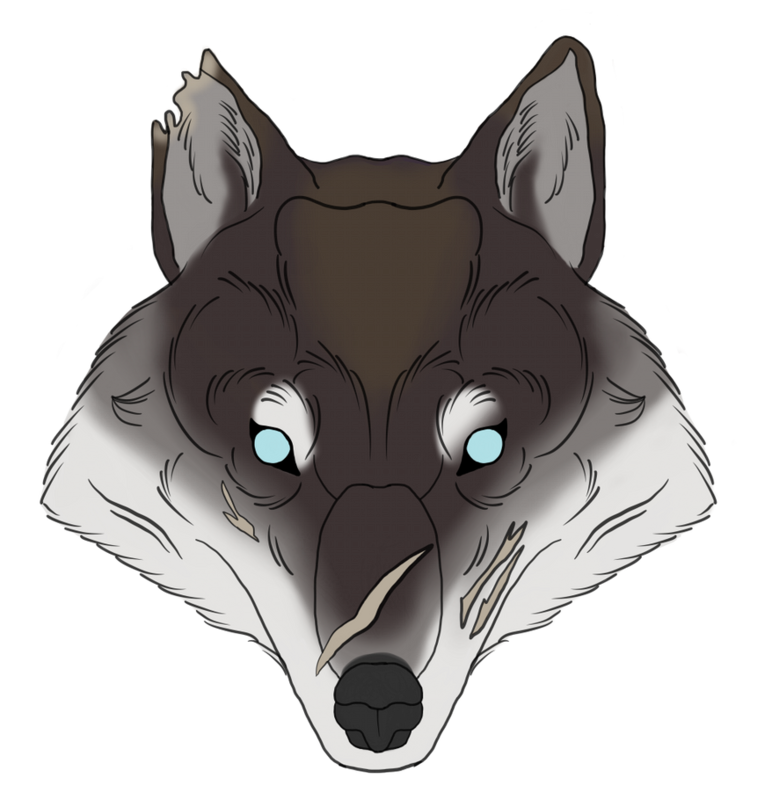 There was some temptation within her to make this new land her home—there were far more wolves here than she had encountered before from the sounds of it, and as frightening as that was, it was still a bit… tantalizing. Thus, the purple-eyed coward made her way after the stranger. When she finally found him, he was examining something quite dangerous. Forgotten steel jaws, relics from that extinct species that had once ruled the world. They had been common enough in Minnesota for her father’s pack to know of them, and the way the monochromatic wolf was staring at them, she wondered if perhaps he was not aware. Whereas she would have attempted to stalk him for longer, getting a feel for his intentions, Theodora was now afraid that the other may become harmed in front of her. “Sir!” The warning call lanced through the air, powered by fear as Theodora began to gallop towards him, best she could on her three good legs. “P-please, leave them be. They will hurt you!” She stalled her progress a bit of distance away, close enough that the other could see the fear on her face, but not so close as to appear threatening. In fact, as she grew closer, the she-wolf naturally adopted submissive posturing. Let this gray-coated wolf know she meant no disrespect in her warnings. ➧➧ sure!!! im really sorry for the delay!! The wolf could smell the jaw-like metal's rust clearly. At this point, it was more than clear to him that this thing was no skull, but just had the shape of it, if teeth were all somehow as sharp as those. It seemed like some sort of copy of what the jaws of a predator looked like, some sort of bizarre sculpture or artwork someone left abandoned for no apparent reason at all. He still didn't understand why his mother told him they would bite him, as the only threatening aspect of the object were the 'fangs'. Being too focused on the metal thing the wolf didn't notice the female trotting to him until she spoke out a warning. Yet another person who believed they could do harm yet would probably not be able to answer why. The silver secui took a step back and gently shifted his gaze toward the pale female, yet still acquiring the most dominant pose he could, to ensure the scared hybrid wouldn't get too close to him. "Hurt?" Auspicium asked, in an arrogant tone unusual for him "How can it hurt me? This... 'thing' is not alive, it is metal. There is no need to worry about it, miss." Now that he thought about it, perhaps he could retrieve the metal jaws back to The Order's camp and trade them later. They were covered in rust, but he knew the value of metal would make most traders overlook the rust, or just be captivated by the object's design. Before he could get back to investigating the metal objects, he was pulled back to his responsibility with The Order, the thing he was trying to avoid in the first place. He had to make sure the stranger was aware she was near The Order's camp. "Plus, I hope you know you are nearing The Order's camp. I advise you to be careful not to trespass our territory" Auspicium added, then turned back around to get back on his business. He didn't mean to come off as rude to the stranger, he just felt as if he didn't have the time to listen to the same tale his mother had told him moons ago all over again. He felt slightly annoyed, partly because he didn't wish to remember his past, but mostly because he still didn't see why disassembling or pulling away the metal thing would get him hurt. Expectations hadn’t altogether been high for Theodora, so she was not at first disgruntled when the monochromatic stranger seemed to bristle at her approach. After all, would she herself not been afraid seeing another wolf running along after her? She maintained her posturing, tongue nervously running along her teeth as he spoke. There was a confidence in his tone, like a teacher correcting a mindless student, and Theodora felt the sting of the chiding in her gut. It was an odd situation for her, one where she felt quite strongly that the stranger was wrong, but knowing it may do no good to argue. He certainly didn’t seem receptive to her warning, or to her company at all. She kept her head bowed low deferentially, her voice taking on an anxious whine. “You are correct that it has no spirit, but p-please be cautious. I have personally seen the repercussions of its teeth.” Theodora was not aware exactly how these creations manufactured injury, but she had assisted her mother in treating the remnants of amputated limbs, or helping with the pain of old scars from mangled injuries. In honesty, she would have liked to join the stranger in examining them, but his standoffishness did not lend itself to comfort, and she dare not go any further without his explicit permission. At his next words, her ears perked upwards inquisitively. “I appreciate the warning, sir. I am unfamiliar with this ‘Order,’ but I will be sure to avoid them.” His turned back seemed a dismissal, but knowing the threat that the metal jaws represented, she still could not bring herself to abandon him. If he lost a limb, her quick action may be the difference between life and death. So, perhaps annoyingly so, she hovered. If he became more aggressive she would flee. Upon further inspection, he did seem to understand why the lady was fearful of the metal jaw's teeth. He assumed any careless animal could brush a little too hard against the sharp teeth and get, in the worst case scenario, some infected scrapes, but nothing too bad at all if treated properly. But the silver secui was no "careless animal", he knew what he was doing and he knew that with the caution he always took when inspecting mysterious objects he would be just fine. In his head he was thinking of a plan to disassemble the metal jaw in a way in which he had little to no contact with the teeth. The silvery wolf decided it would be better not to stick his nose directly into the jaw, but to stick it on the ground then slowky guide it to the jaw's side and flip it around. from there he would try to pull the jaw from the circle-like base from its original place on the forest floor to The Order's camp. then he could maybe ask someone for a hand, quite literally, to disassemble the jaw and then he could trade the metal parts for something else, something useful to him. As his muzzle got closer to the metal jaws, Auspicium heard a loud *CLINK*. The jaw seemed to have become alive simply from being too close to it, the jaws snapped shut swiftly, startling the grey-painted secui with the sound of the metal hitting each other with impressive strength. Auspicium's vision went completely black for a handful of terrifying seconds, and he instinctively jumped backward. His muscles had completely tensed and each hair in his pelt stood as if it wanted to run away from his very own skin. After the initial shock had passed the first thing he did was to make sure he wasn't hurt, as he knew adrenaline would make any potential wounds not hurt as much as they should. A false sense of calmness waved through his body as soon as he checked the ground and saw no blood and took a quick glance at his body and saw no wounds. His heart was hammering his chest and had no control over his startled lungs. He tried to take deep breaths, taking control of himself again slowly but surely. Shaky light blue eyes then went from the deathly jaws to the female who had warned him about them. Finding out the jaws could be snapped shut without them having to be alive was an exaggeratedly earthshaking event for him. Of course there had to be a reason as to why that would ever happen, but in the middle of his panic, he couldn't find one at all. Template by Kitty, edits by Ad, image by Silvia Susen. With her nerves plaguing her, every second that the stranger went closer seemed to stretch into eons. Despite her terrors, Theodora sat steadfast, waiting to see what would happen—maybe he would be correct, and simply move among the teeth like a ghost, completely unaffected. She would feel stupid, surely, but it would have been a positive outcome… Thus she sat, hoping mutely that she would be proven the village idiot, while Auspicium made his way to the ancient object. The sound it made as it attacked him shocked them both, with a yelp escaping Theodora’s throat, her legs skittering in a graceless jump straight into the air as though it might dash at her as well. “Are you okay?! Did it bite you?” Her words were frantic, concerned regardless of whether the male had wanted her company at all. She paced back and forth, hesitant to approach him without any obvious injury or the smell of blood, and the wolf glanced back at her. The unexpected trauma of it was written all over his countenance, but his whites were still pure and his black not speckled by blood and so she stayed where she was, not eager to push him further into panic with her approach. I knew it, I knew those things were dangerous! In a scientific way, it was almost fascinating—she could finally say how these jaws went about their business, even if she couldn’t exactly explain why they bit. It had almost been too quick to see, far faster than Theodora could chomp to be certain. How exactly it had decided to bite Auspicium was still a mystery, but she found herself greatly relieved that he appeared uninjured, at least physically. The teeth appeared together now, unable to bite. Had they been rendered ineffective now? Theodora was certainly too timid to approach and find out. “W..what happened? How did it know…” Her brow furrowed, she hoped her company found her a bit more palatable now that she had proven herself not quite as stupid as first thought.